The Square face shape has a strong, square jaw line and a square hairline. This face shape is generally symmetrical and strong. The goal of your haircut should be to play down your strong, angular jaw to soften your face. Here some recommended cuts followed by some style suggestions at the end. If you have a square face shape the best haircut is one that accentuates or adds texture. 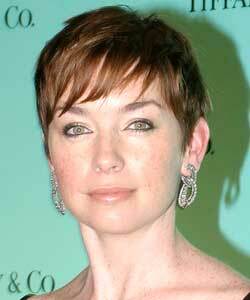 This face shape can wear short or long styles, but cuts that add crown height work best. No matter what length you choose, have your stylist work in some wispy bangs. Choppy ends are an easy way to add this texture, while wave or curl adds softness to your angular features. If you have straight hair, a permanent or body wave can help create this softness. This face shape can wear short or long styles. If you're a fan of bangs, go with wispy, side swept ones or piecey ones to soften the features. Choose off-center parts to de-emphasize the width of your face. Like those with round faces, you should choose a cut and style that creates height at the crown to add length to your face. Here are few selected videos that shows how to match your style when considering hair types. If you like short hair, try a layered bob that ends above or below the jaw line with wave or roundness around the face. Both Demi Moore and Isabella Rossellini share your face shape, and both have favored short styles such as layered bobs ending below the jaw line or or crops with wispy bangs. Another great choice for the square face is a short, spiky cut like the one favored by Pink. If you like long hair, try a long style with layers that begin at the jaw line and continue downward. The wispy bangs mentioned above are an asset to this look, and can be worn a number of ways. A great example of this look is Holly Marie Combs' hair style on "Charmed." For those who enjoy sports activities, a square face looks best when the hair has crown height. For short hair, you and those with a round face have a simple solution. Use a thin head band to push the hair back from the face while creating volume at the top and sides of the crown. This elongates the face. To soften your look leave a few wispy bangs loose. Although a slicked back ponytail doesn't flatter, the square face, don't nix the ponytail as a choice. The square face can wear a ponytail so long as the bangs are kept loose, and the crown height is kept up. Try pulling the hair back in a graduated series of ponytails securing the first loosely at the top of the head just below the crown. (Don't pull the hair back tightly on the first section or you'll flatten out your hair at the crown.) Pull the hair back in sections securing each with a rubber band while attaching it to the end of the ponytail above it. Continue until all of your hair is in the ponytail series. The end product is a faux French braid look that takes only a couple of minutes to complete. No matter the length you choose, you should avoid long, one-length straight styles, chin length styles and blunt cuts. Stay away from styles requiring a center part which creates a harsh dividing line on your face and makes your face seem wider than it is. By including a few layers to build texture, especially at the crown, and working the majority of the waves and curls beneath the jaw line, the square faced person can wear almost any style. Since hair styles change often, one of the easiest ways to keep abreast of the latest looks great for your face shape is to identify celebrities who share it, and keep up with the looks they're sporting. In order to soften the angle of your jaw line you can apply darker shading on edges and use blusher in a soft curved line around cheekbones to emphasize it and draw attention away from your jaw line. Also try to use lip pencil in middle section to make your lips slightly fuller.